So, last week I made Key Lime Pie Dip. I wasn't too sure if you guys would get as excited as I did about a new spin on an old classic but you did! It quickly went to the top of the blog stats for the week and blew up Pinterest. YOU GUYS. I love how you get me. So, I got to thinking what else I could take from a pie to a dip and, since I have a (somewhat irrational, possibly unhealthy, maybe obsessive) love of coconut, I decided to test out a recipe for Coconut Cream Pie Dip. Once I hash out my next “pie dip” I think it will be so cool to serve three choices at a party with an assortment of graham crackers and shortbread cookies! I’m thinking a Peanut Butter Cream Pie Dip served with chocolate graham crackers would be insane!!! DIBS! I said it first! You heard it!!! That’s my next project! UPDATE: Here's the recipe for Peanut Butter Cream Pie Dip. Add cream of coconut and milk to a stand mixer or large bowl (using a hand-held mixer) and mix on medium speed until smooth. Add pudding mix and sweetened condensed milk and mix until thoroughly combined. 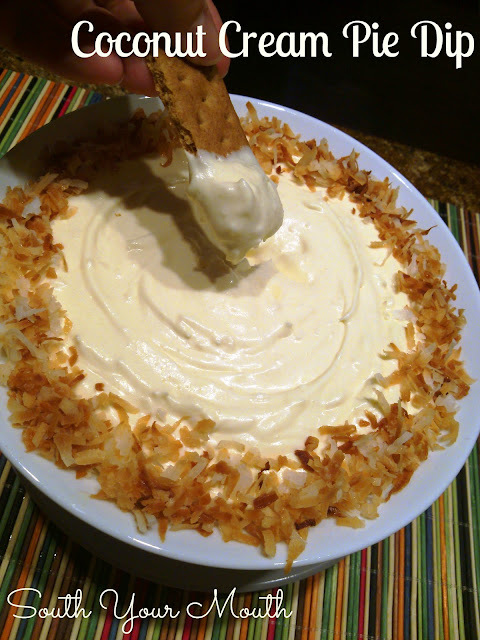 Fold in a heaping cup of toasted coconut and cool whip and mix until just combined. You can absolutely use the dip as pie filling. This recipe will easily fill two prepared pie crusts. Yum! Will have to try this! LOVE coconut! What about a Cheesecake dip!?!? I don't think so as traditional pudding requires heat to thicken. Maybe you can google substitutions for instant pudding?? Forget the cookies and just give me a spoon. This looks so good!!!!! Where do you get cream of coconut? We can get it in the grocery store around here. It's usually where the cocktail mixers are as it's used to make Pina Coladas. i'm in Canada, could you show me a picture of it so I can look for something like it here. Thank you so much. Do you think coconut milk would work? I think you might be my new best friend! Shut the front door. You are now my BFF. I love everything coconut. Can't wait to try this. Heck, I'll probably sit and eat it with a spoon. That's exactly how I finished off the leftovers!! the recipe says 'heaping cup of coconut and cool whip - is that a heaping cup of cool whip or do you mean and cool whip as in the entire tub? A heaping cup of coconut and then also add the entire tub of cool whip. This sounds incredible!! I too am a coconut addict. If I wanted to go overboard, I would use the Trader Joe's Crispy Thin cookies in Coconut. They are stupid good. Meyer Lemon ones are good too. Or mix in some toasted almond slivers and use the really thin chocolate cookies (around for years - can't think of their name). My thighs are currently cursing you. :) Going to look at key lime recipe right now. OMG!!!! O___o I am sooooo making this for a birthday I have to go to this weekend :) Thanks for posting! Absolutely fabulous recipe!!! I can't wait to try it. WOWZERS for sure! So glad you shared at Weekend Potluck. Your wonderfully delicious dip recipe is being featured at Weekend Potluck! Please stop by and snag your Featured Button. Can't wait to see what you bring next time. Enjoy a wonderful weekend. Thanks again for sharing. I too am a coconut nut. Coconut cream pie, coconut cookies, coconut cake, coconut bread, coconut ice cream, Pina Coladas, coconut tarts, coconut chocolate bars, coconut fingers, coconut squares, coconut pie crust and now coconut cream pie dip. Today is my lucky day! I'm going to try dipping fresh fruit in it. Toasting the coconut dresses it up ever so nicely. Thank you for another great find for my coconut collection. I am a coconut lover, but we need a chocolate cream pie dip to go with this! Please, please, please! These are going to be a big hit at my holiday open house. Thanks for sharing; looking forward to more great ideas. Lawd hab muhcy! I just came across your site. Literally last night I found it and currently have the chicken perlo simmering on the stove AND the fried ice cream cake chillin in the freezer. I was looking for a perlo recipe like my mama makes and found that plus soooo much more! I love coconut and will be making this dip for my next tailgate. I am a SC girl too! Go Gamecocks! Have you tried it with fruit? It sounds like it would be good as a fruit dip too! I just have to say that this is one of the best recipes I've gotten in a long time. I made it for a family gathering over the summer and my nieces loved it. One of them couldn't get enough of it and referred to it as coconut crack. We joked about having to do an intervention. LOL So now ever time we get together I have to make it. Thanks so much for the recipe. Hi - you indicated that this would fill 2 pie crusts. Does it set up enough to slice? I made this yesterday and my friends loved it! I’m not a lover but their expressions were very reassuring that it was an excellent pie!